Alice St. Pierre enjoyed a sunny afternoon aboard the gambling ship Aquasino but said Lynn's newest waterfront business needs to add more penny slot machines and improve its buffet. "We thought the staff was great," said St. Pierre. The 225-foot-long Aquasino has sailed out from the pier off Marine Boulevard since June 28 - bad weather notwithstanding - with about 150 passengers aboard on each afternoon and evening sailing, said ship Marketing Manager Jason Walsh. Aquasino operators have had to put the brakes on increasing the number of people like St. Pierre who pay $13, and another $20 for the buffet, to board the ship. The ship sails at 11 a.m. Wednesday through Sunday and 7 p.m. Wednesday through Saturday with a Boston view from its roof deck and gambling, including slot machines and table games, on its other three decks. 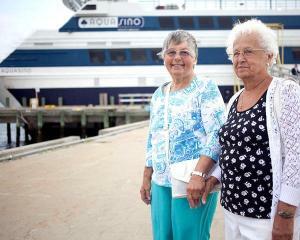 Judy Johnson of Reading boarded the ship on Wednesday as part of a daytime outing organized by her aunt. She said the ship's slot machines are arranged to provide passengers with plenty of room to play. "Someone hit for $2,500," she said. Walsh said the highest recorded payoff on the 220 slot machines is actually $1,800 with several other smaller jackpots. "On Wednesday alone we had three jackpots," he said. Niki Kneeland of Winthrop praised Aquasino owner James Walsh for the attention he lavished on passengers Wednesday, and Sophia Grasso said the ship's employees and the onboard food were "awesome." "I almost got all my money back," she said. Experienced gambler Mike Gray of Nahant said the ship has a wide variety of slot machines. "They are still in a working-it-out phase, but it was worth the trip," Gray said. Adell Coren of Boston said Aquasino's food selection needs improvement, and Walsh said the 60 employees who work each sailing shift aboard Aquasino review complaints and problems after every cruise. "We take suggestions very seriously," he said. He said ship workers can provide parking for 300 people next to the fenced-pier area where the ship docks and the ship's ticket office. James Walsh and Elevator Interior Design owner John Antonellis reached an agreement this week to allow Aquasino to use Elevator Design's parking lot a half block from the pier after business hours. "We were able to put James Walsh and John Antonellis in a room and they quickly came to an agreement," said Economic Development and Industrial Corporation Director James Cowdell, adding, "There will be plenty of parking there." Coren and her husband, Leron, decided to try out the Aquasino after her parents enjoyed their gambling cruise aboard the ship. JoAnn Marquis said she does not gamble "a lot," but said she enjoyed sitting on Aquasino's upper-level sundeck with her husband, Michael. "It was a great trip," he added.